Longer days… I love not having to drag the kids out of bed when it’s still dark out and have so much fun playing outside with them until bed time. Gardening… I’m currently munching on a bowl of raspberries that I just picked from our garden. My herb garden is overflowing, my zucchinis are starting to grow and little tomatoes are starting to form. No rain (or at least very little)… people think that it rains all the time in Vancouver, which is true, in the fall, winter and spring. We are blessed with beautiful summers though. Not too hot, not too cold, and we can go over a month without any rain during the summer. 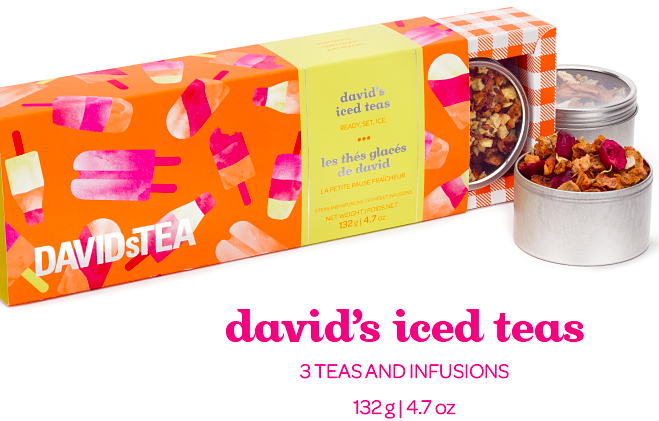 DAVIDsTEA Summer Collection and $1.00 Iced Tea Mug… I wait in anticipation for it each and every summer. 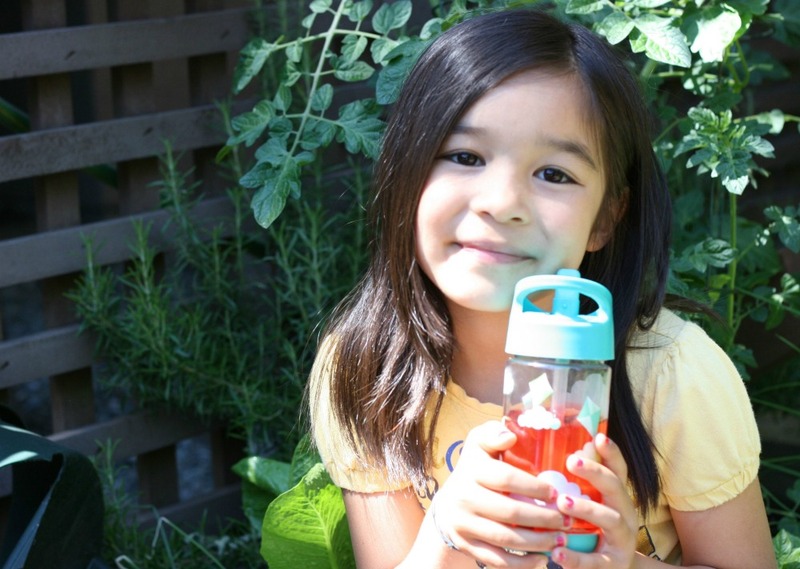 The release of the DAVIDsTEA Summer Collection and their $1.00 Iced Tea Mug. The summer collection is always filled with sweet and fruity teas that are so yummy served iced, for hot summer days! Each summer DT also has a new summer tumbler and if you bring it into the store you can fill it up with the iced tea of the day for just $1.00! 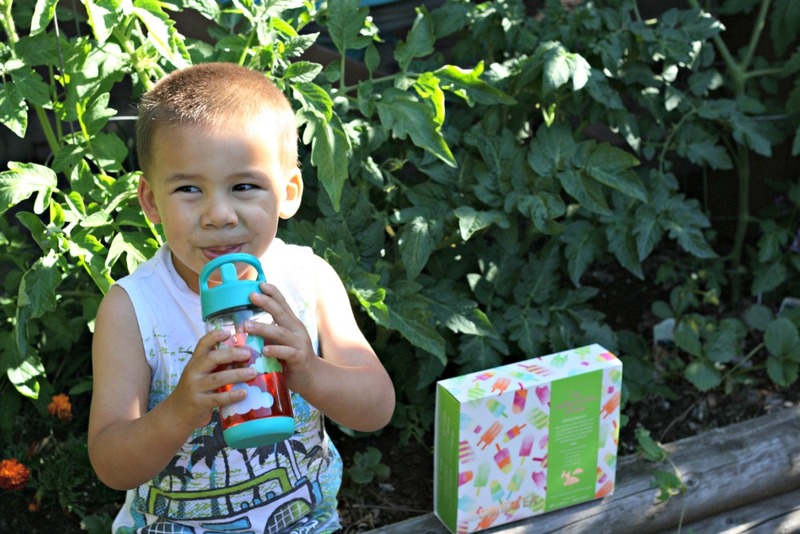 My kiddos wait in anticipation for DAVIDsTEA’s summer collection too. We always start the summer off with a DAVIDsTEA Summer Collection boxed set so we can sample all of the flavors. The kids each chose their favorite flavor and then it’s off to DAVIDsTEA to buy a big tin of it to get us through the summer and fall. Hard Candy (fruit infusion)- With sour cherries, kiwi and coconut, it has all the taste of a candy shop treat – at next to no calories. Coconut Ice (fruit infusion)- A refreshingly decadent blend of honeybush, coconut and cocoa shells. Rich, smooth and totally addictive, it tastes just like a scoop of coconut ice cream. Strawberry Colada (fruit infusion)- This sweet and fruity, retro cocktail-inspired tea, reminds us of an tropical drink. With strawberries, pineapple and coconut, it’s like a perfect summer getaway in a cup. Just Peachy (fruit infusion)- The perfect peach tea. This sweet, summery blend is so peachy, it tastes like it’s fresh from the orchard. Filled with peach, apple and sweet blackberry leaves. Pom Tango (black tea)- This exotic fruit-filled black tea is a sure sign of sunnier days ahead. Bursting with fruity pomegranate seeds and big, luscious pieces of mango, it’s like a cross between your favourite breakfast tea and the best juice ever. Do I have your mouth watering yet? Good! Guess what?!?! 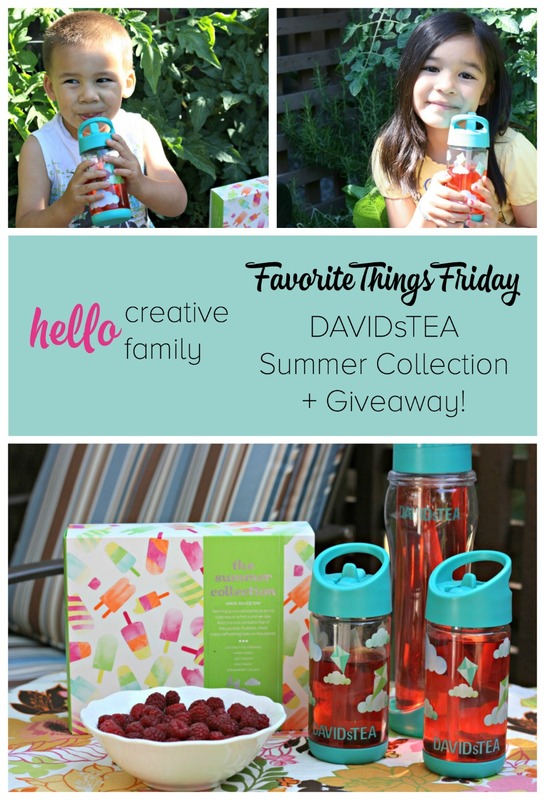 DAVIDsTEA wants to send one Hello Creative Family winner a box of David’s Iced Teas! Enter below and tell us which tea from DAVIDsTEA you’d most like to try! Good luck! Contest open to those with a Canadian or US shipping address only. Thank you to DAVIDsTEA for sending us our summer tumblers and the summer collection! All thoughts and opinions are 100% my own. i would like to try: strawberry colada! I’d really like to try the coco-lemon thai white tea! I’d love to try their Secret Weapon Tea! I would like to try Pink Lemonade. I would like to try the coconut. I’d like to try ruby red herbal tea. i would like to try Just Peachy; yum! I would like to try the coco-lemon thai white tea! I think Pink Lemonade and Strawberry Colada look great, I would love to try both of them. I would love to try the Strawberry Colada! I LOVE the coconut ice!! Been making some adult cocktails with it….yum! Wow the flavors sound delicious. The most intriguing is the coconut ice, yum. Hoping I win and get to taste it. I would love to try the la la lemon (organic) tea! I would like to try the strawberry colada. I’d like to try honey, i dew. I would love to try strawberry colada. I’d love to try the hard candy! I’d like to try the cranberry pear tea. I want to try the Egyptian Chamomile herbal tea. I would like to try Coconut Oolung. Secret Weapon Tea is a must try for me! I would like to try the mango madness flavor. My son is the real tea lover though! I would like to try Strawberry Colada ! I would like to try their Coconut Oolong tea the most.